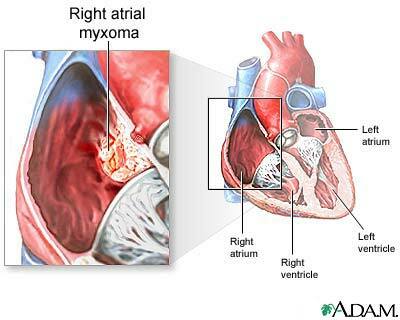 Many myxomas will not cause symptoms. These are often discovered when an imaging study (echocardiogram, MRI, CT) is done for another reason. 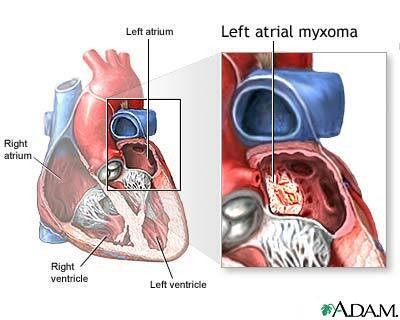 Myxomas may come especially back if surgery does not remove all of the tumor cells. Lenihan DJ, Yusuf SW, Shah A. Tumors affecting the cardiovascular system. In: Zipes DP, Libby P, Bonow RO, Mann DL, Tomaselli GF, Braunwald E, eds. Braunwald's Heart Disease: A Textbook of Cardiovascular Medicine. 11th ed. Philadelphia, PA: Elsevier; 2019:chap 95.